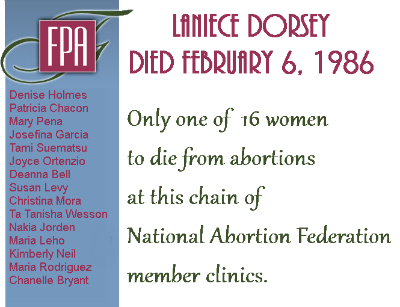 Seventeen-year-old Laniece Dorsey underwent a safe and legal abortion at a Family Planning Associates Medical Group facility in Orange County, California, on February 6, 1986. FPA is a National Abortion Federation member facility. Laniece lapsed into a coma, was transferred to a nearby hospital, and died later that day. The Orange County Sheriff's Department medical examiner blamed the death on cardiorespiratory arrest due to the anesthesia, although he also found "a thick adherent layer of fibrinous material containing moderate numbers of inflammatory infiltrates" in Laniece's uterus. Life Dynamics lists 26-year-old billing clerk Kathy Davis on their "Blackmun Wall of safe and legal abortions. Citing Kathy's death certificate, Life Dynamics says that Kathy died at Cleveland Metropolitan General Hospital of heart failure and hypertension following a legal abortion on February 6, 1987. Elizabeth Hellman was the 35-year-old wife of an Air Force major who had been stationed in Tokyo for over a year. Evidently Betty found the separation lonely, for she became pregnant while he was away. On January 28, 1952, Betty was admitted to the Tinker Air Force Base hospital in critical condition, suffering from pain and low blood pressure. Her red blood count was very low, and her white count very high, indicating infection. She admitted to having undergone an abortion on January 25. When questioned by investigators on January 31, Betty said that friends had referred her to a woman named Jane. She was shown a photo and identified the woman in it, 43-year-old Mrs. Jane McDaniel White, as her abortionist. She gave White's address as the place she had gone for the abortion. Betty said that White had put her off for several days while she got over her fear of undergoing the abortion. She promised White $100, but only paid her $50. White initiated the abortion with some kind of packing and sent Betty home. Betty became very ill, and called White, who with her daughter came to Betty's home and "scraped her out". After Betty gave her statement, police raided White's home. White and her daughter, Mrs. S. B. Anderson, Jr., were nowhere to be found. Police eventually tracked the pair down and arrested them for murder and procuring an abortion. Betty died on February 6, from peritonitis. Her husband had managed to rush home from Tokyo in time to see his wife before she died. An autopsy verified that an abortion had been performed and had caused Betty's death. The criminal case against White went well until the defense managed to have the Betty's deathbed statement, given on January 31, inadmissible because it couldn't be proved satisfactorily that Betty believed herself to be near death. With the deathbed statement thrown out, the case was dropped. This had been White's third arrest for abortion charges. She had been convicted in 1947, under the name Jane McDaniel, and sentenced to seven years, but the conviction was thrown out on a technicality based on how advanced the girl's pregnancy had been. A new trial had been scheduled, but it never took place because the main prosecution witness had left the state or died. White was clearly operating as an abortionist, since an operating table, fashioned from an old restaurant table, and surgical instruments had been sized from her home at the time of her arrest -- "enough instruments and medicine to stock a small hospital." She was charged again in 1951 but the main witness had vanished and the case had been dismissed. On February 6, 1919, 22-year-old homemaker Edna Griffith died at Chicago's Passavant Hospital from septic pneumonia initiating from complications of an abortion perpetrated by a person who was never identified. A Coroner's Inquest was held regarding the February 6, 1870 death of 22-year-old Mary Donigan. Mary died at the Brooklyn home of Mrs. Bridget Dillon, who testified that she'd known Mary for about 18 years. Mary had come to her home on a Monday afternoon about three weeks before her death, looking very sickly but not complaining of illness. By the time Friday came around, Mary was reporting being sick with diarrhea. Mrs. Dillon gave her some brandy at about 11:00 that night, but all this did was make Mary vomit. Mary slept until noon the next day. Mrs. Dillon checked on her and found her appearing very ill. Mrs. Dillon offered to empty the slop pail in the room, but Mary said, "No, I've had a baby and it is in there; my mother sent me down to Margaret Farrell's, but she wouldn't keep me, so I thought I would come to you." Mrs. Dillon looked in the pail and saw the baby, which she described as large -- in keeping with Mary's report of having been pregnant for about eight months. Mary reported that she had paid a doctor $5 for a bottle of medicine -- she refused to name this doctor -- and that she had thrown the bottle "in the water closet." Mrs. Dillon testified that Mary reported having taken the medicine about two or three weeks earlier, and that afterward she'd not felt her baby moving any more. Mary likewise refused to divulge to Mrs. Dillon the name of her baby's father. An old woman Mrs. Dillon believed to be Margaret Farrel came to help Mrs. Dillon care for Mary. Mrs. Dillon testified that she'd asked Mrs. Farrel what to do about the baby, and Mrs. Farrel had suggested getting a small box to bury the baby in. Mrs. Dillon went off in search of a box, and returned to Mary's room to find both Mrs. Farrel and the baby gone. By Monday, Mary was up and dressed and went downstairs against Mrs. Dillon's advice. Mary quickly took ill again, so mrs. Dillon helped her back to her room and dosed her with castor oil. "She was quite exhausted." Mrs. Dillon went to a druggist and described Mary's symptoms. The druggist provided some powders that she was to give to Mary every hour, but Mary didn't want to take more after the first dose, reporting that they only made her feel worse and blistered her mouth. Mrs. Dillon sent one of her "girls" to consult with the druggist but he had nothing further to offer. Mary refused the services of either a doctor or a priest. The following morning, Mary had taken such a turn for the worse that Mrs. Dillon sent for both a doctor and a priest. The doctor, Matthew F. Regan, told Mrs. Dillon that Mary was dangerously ill.
Dr. Regan testified that he'd been summoned to a garret room where he found Mary in bed, "suffering from inflammation of the womb and the covering of the bowels." Mary reported being married and having suffered a miscarriage the preceeding Friday. Dr. Regan prescribed some medication and returned on Saturday. At that time, Mary admitted that she wasn't married, and that she'd not seen a doctor or had any sort of abortion performed. He told her that her condition was very grave, "that I had seen women die who were not so low as she was." Mary identified a Mr. Burdie, who worked in the brick yards in Haverstraw, where Mary lived, as the father of the baby. When Dr. Regan returned at noon on Sunday to check on Mary, he found her dead. Dr. A. W. Shepard performed a post mortem examination on Mary and found no signs of instrumentation, but plenty of signs of infection in and around the uterus. He determined that she had died from an abortion.